Watch and find out what tow car ability the all-new Seat Ateca has! What's new here? Well, everything! The Ateca is an all-new model, and Seat’s first SUV. It’s a rival for the Nissan Qashqai, Hyundai Tucson and Škoda Yeti. Under the skin it’s a close relative of the Volkswagen Tiguan, although it’s a little shorter than the VW and considerably more affordable. There’s a choice of petrol and diesel engines, with front- and four-wheel-drive versions. We’re testing the range-topping 190PS (187bhp) version with the 4Drive 4x4 system and a DSG automatic transmission. What are we looking for? Well, this is a tow test first and foremost, and with such a powerful turbodiesel engine we’re expecting strong acceleration. Stability at speed when hitched up is also a key quality in a tug. So, let's find out what tow car ability the Seat Ateca has! The Ateca range comprises a broad choice of engines, from a surprisingly lively 1.0-litre petrol to the 187bhp 2.0-litre diesel tested here. We think the latter, along with the 148bhp 2.0-litre TDI, are the models that are likely to be of most interest to caravanners. If you prefer a manual gearbox, you’ll have to stick with the less-powerful 2.0-litre engine. The 187bhp version gets the DSG auto only. A front-wheel-drive version of the 148bhp 2.0-litre TDI is on the way, but from launch both 2.0-litre diesels are four-wheel drive. The 4Drive system uses a Haldex coupling to send power to the wheels that can make best use of it. The extra weight of the 4x4 hardware makes these the heaviest models, with the healthiest matching ratios. The most powerful Ateca has a kerbweight of 1589kg, giving an 85% match figure of 1351kg. The legal towing limit is 2100kg, a very high figure for a car of this size and weight. The noseweight limit is 80kg. To truly understand what tow car skills the Seat has, we matched it to a Swift Expression 586 with a Mass in Running Order of 1325kg. With 295lb ft of torque, the engine matches the pulling power of the equivalent Hyundai Tucson and Kia Sportage, and comfortably eclipses the brawniest Nissan Qashqai. The automatic gearbox changes gear quickly to make the most of that torque, and even in Sport mode the DSG swaps ratios smoothly. At the test track we recorded a swift 30-60mph time of 9.2 seconds. On the road that translates into confident overtaking and no loss of speed even when pulling a caravan up steep hills. The brawny engine just rolls up its sleeves and gets on with the job. The Seat Ateca stops as well as it goes. On a dry track, car and caravan stopped from 30mph in just 10 metres. 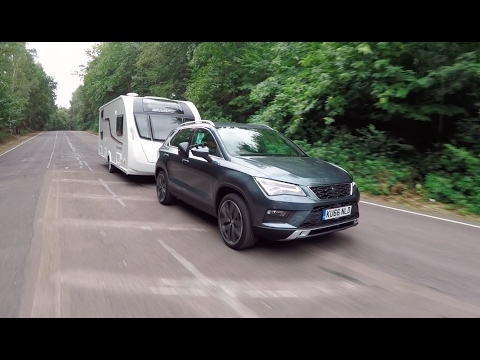 Even with the brake pedal on the floor the manoeuvre was undramatic, the Ateca pulling up straight with no shunting from the caravan. The lane-change test can outwit some tow cars, especially SUVs with their relatively high centre of gravity. But the Seat was untroubled by our emergency swerve, gripping securely and with modest lean. Even on our fastest attempts we felt no pushing or shoving from the caravan. Usually cars that take the lane-change test in their stride make towing on the motorway seem relaxed and easy. For the most part that proved true of the Ateca. However, once or twice we felt a little side-to-side movement on the motorway when overtaking a high-sided vehicle. The movements were very slight, but noticeable. A hill-start in the dry ought to be straightforward, towing with such a powerful four-wheel-drive car, and the Ateca performed as expected. The electronic parking brake held car and caravan still, then released smoothly. The car easily pulled to the top of the gradient with no need to rev the engine hard. Apart from very slight movements when passing large HGVs, the Ateca didn’t put a foot wrong as a tow car. It’s very quick, the brakes are excellent and it handles emergency manoeuvres with aplomb. Leave your caravan on its pitch and the 187bhp Seat Ateca can really show off. In a straight line it’s more hot hatch than family SUV. It corners well, too, with precise steering and a level of agility most rivals struggle to match. Drive sensibly and there’s plenty of grip, with the Ateca gently pushing wide if the driver misjudges a bend or becomes a little too enthusiastic. The Seat Drive Profile system allows the driver to choose different modes for the steering, throttle and gearbox. Turn the knob towards the chequered flag symbol and the car’s responses sharpen, plus the steering wheel is weightier. However, there are no adaptive dampers, so the suspension remains the same. That’s a mixed blessing. The firm set-up delivers impressive control at speed, but when you’d rather drive more gently the ride can feel a little too firm for comfort. A little less road noise at speed would also be welcome. However, firm ride aside, the Seat Ateca feels at home on urban roads. All-round visibility is good, and the relatively compact size helps on busy streets. The DSG transmission is smooth and affable when edging through heavy traffic, but responsive when the road clears and you want to get a move on. Despite the rather firm edge to the ride, overall the Ateca is one of the best compact SUVs from the driver’s seat. The Seat Ateca has a driving position that most drivers should find comfortable on long journeys, with enough adjustment of the seat and wheel to suit both tall and short people. The seat is supportive and comfortable. There are no surprises with the dashboard design, which is neat and ordered, if a little uninspired compared with the sharp exterior styling. The 8.0-inch colour touchscreen is surrounded by shortcut buttons, which we prefer to wading through on-screen menus. Build quality is solid enough, but the cabin doesn’t match the plush feel of a VW Tiguan’s. But, given the Seat’s very competitive pricing, it’s easy to forgive the car some hard plastics here and there. There’s enough space for adults to travel in comfort in the back of the car, although the big transmission tunnel eats into foot space if you carry three passengers in the back. There are air vents between the front seats to keep those in the back supplied with chilled air. Boot space is where the Ateca really scores over its key rival, the Nissan Qashqai. Two-wheel-drive versions have a 510-litre boot, beating the Nissan by a considerable 80 litres. 4Drive models such as our test car have a slightly smaller 485-litre boot. Levers on either side of the tailgate make lowering the back seats a quick and easy job. Once they are folded, the capacity increases to 1579 litres for 4x4 models. There’s a slight slope to the floor with the seats lowered, but that’s a very handy load bay for trips to the tip and the like. Seat has priced the Ateca keenly. The range starts from £17,990, which is £555 less than the cheapest Qashqai. Our range-topping diesel costs £29,990. That’s slightly more than the most expensive Qashqai, but the Nissan’s 128bhp engine is nothing like as powerful as the Seat’s. The 2.0 TDI 190PS undercuts the equivalent Tucson (£32,700) and Sportage (£31,900). It’s early days for the Ateca which, together with strong demand, means dealers aren’t giving away big discounts. However, What Car?’s Target Price team have found that it’s possible to save £745. Your £29,990 buys a long list of standard equipment. Keyless entry, a wireless phone charger, cruise control, a rear-view camera, dual-zone climate control, rear parking sensors, an 8.0-inch touchscreen sat-nav system, a DAB radio and leather upholstery are standard on Xcellence cars. In fact, all but the entry-level S-spec models are well equipped, although the engine and transmission combination tested comes only with the range-topping trim. Safety kit is comprehensive, with driver, driver’s knee, passenger, side and curtain airbags, along with stability control, autonomous emergency braking, and Isofix mounting points for rear child seats. The Ateca has a five-star rating from the safety experts at Euro NCAP. According to the official figures, the Ateca is capable of 53.3mpg on the combined cycle. Compare that with 43.5mpg and 44.8mpg for the equivalent Hyundai Tucson and Kia Sportage. Towing on a mixed route of A-roads and motorways, we achieved 26.4mpg with the Seat Ateca. When the time comes to sell, What Car? predicts it will be worth a healthy 48% of the original price after three years. If you have a budget of around £30,000 for an SUV and you’re wondering what tow car to buy, there’s no shortage of accomplished cars for you to spend your money on. The Seat Ateca is one of the best. The combination of a powerful engine, a slick-shifting gearbox and four-wheel drive makes this a quick and efficient all-weather tow car. With so much power and torque, the Ateca can easily tow any sensibly matched caravan. It can handle itself in an emergency, too. Stopping from 30mph required just 10 metres, and the Seat tackled the lane-change test with ease. Only some slight movements when overtaking large vehicles prevented the Ateca scoring more highly in the towing test. As a solo drive, the Ateca is one of the sportiest Sport Utility Vehicles of its size. On the right road in the right mood, it’s a satisfying car to drive. But the ride is on the firm side. A more supple approach to bumps around town and less road noise would make the Seat better still. Inside, the Ateca is one of the most practical cars in this class. The driving position and front seat are comfortable, and there’s room for adults in the back. The boot should cope with most families’ caravan holiday luggage, and it’s bigger than a Qashqai’s. What’s more, the Ateca is better value than most of its rivals. Not only does it undercut them on price, but most trim levels also come packed chock-full of equipment. Impressive fuel economy and strong predicted resale values make the Seat a sensible buy, too.